From right bottom, in left-handed, Frodo, Merry, Pipin, Sam. It is difficult to make difference them. This is adorable! I especially love Pippin's expression! 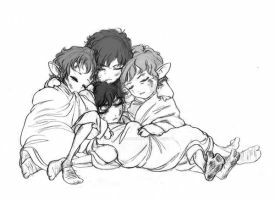 My four favorite little Hobbit~! I love this bird's-eye-view perspective! They all look so happy and peaceful. They're sooooo adorable! I love how Sam is kindo tubby, and Frodo's expression is beautiful! Aw wow, this is so cute! Oh, then your friends would be good friends like four hobbits! This is sooooo beautiful! T0T I love it! Fave'd for all time! lovely! keep up the good work! Their so cute, love AMAZING. Its okay, I wouldve made the same mistake. I wish I could draw like that!!! You're amazing!!! Thank you^^ but I want to be able to draw better. If you work at it, you could be the next Vincent van Gogh... just dont go crazy and chop off yur ear.